This year’s art gallery features work by Eid Suleman, Visualising Palestine, Students of the Alrowwad Cultural and Theatre Society and various screenings of shorts, trailers and moving image. Eid Hadaleen is a Palestinian Bedouin living in the village of Um el Kheir, which is neighboured by the Israeli settlement of Karmel. The short stop-motion animation film Eid, produced by the Saaheb Collective, was screened as part of the 2011 festival alongside Eid’s models. In 2011 Eid was given a small grant by the Al-Ghadeer Foundation for Young Emerging Artists which he decided would be to build my dream home. After a year of working on it he finally built his dream home. It is about a meter and a half long and there are eight rooms and a garden on top with solar panels and wind turbine. There is a room for his children Sadin and Lin, for Na’ama and Eid and for his friends who come to visit. There is a living room, a play room, a kitchen, shower, bathroom and his workshop. In the meantime, the threat to his real home in Um el Kheir goes on. The last time the military and civil administration came to demolish a house in his village he ran home to take out all of the important things out – as you never know which houses they are going to demolish. So he took all the valuable things out of the house, which includes his models. Eid is not sure he knows how to take his dream house out since it is so big. 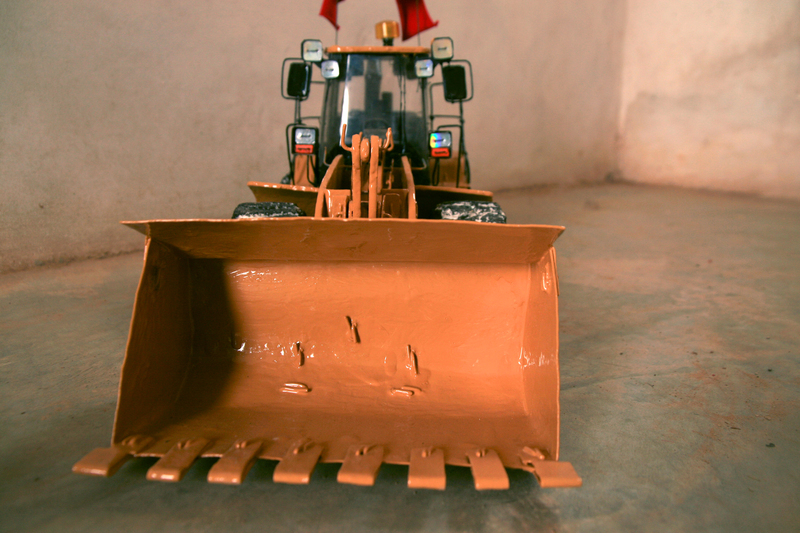 This unique piece (Wheel Loader Caterpillar Tractor, 2012) was commissioned by the Bristol Palestine Film Festival from artist Eid Suleiman Hadaleen. The Caterpillar tractor is a familiar sight to anyone living in the Occupied Territories. It embodies the cycles of destruction and construction that are constantly reshaping the land and lives of the South Hebron Hills. The yellow Caterpillar is symbolic of construction, as opposed to the military vehicle used for destruction, but construction is not necessarily positive. Likely it will be a new settlement, barrier, or road, bringing further constraint to the lives of Palestinians. But as Eid says, ‘We have to hold people to account, not machines’. We are auctioning this unique model over the course of the Festival, to benefit Eid and the Villages Group. This is a silent auction and will close on the last day of the Festival – 16 December 2012. Find out more and how to bid here. In collaboration with the Bristol Palestine Film Festival, this work focuses on the festival’s contributors and their relationship to Palestine. Investigating the link between personal and national identity through collecting and archiving, the work illustrates the Palestinian diaspora, the difficulties of exile and the challenges of looking forward. Facilitated by Activestills photographer Keren Manor and guest photographer Mareike Lauken these photographs are by far some of the most beautiful we have ever seen. Taken by women from Susiya to document their everyday lives, these photographs were not only composed by the women, but were later also exhibited in their homes for others in Susiya to engage with their creativity and their visions of life in the village. It is clearly evident from the excepts below that photographers are clearly in love with the subjects. Around 400 people from 45 shepherds and farmers families are living in the Palestinian village of Susiya, located in south Hebron hills. Recently Israel’s Civil Administration distributed demolition orders to over 50 structures in the village and whilst various websites and online initiatives were launched by different groups to prevent the demolitions, it was felt that all these missed an important element – who the people from Susiya are, what their lives are like, and what the destruction of their homes would do to them.